So where do I begin…. Words fail, eyes stare in disbelief and your soul forever remains changed..altered. If you dont know what I am talking about you obviously haven’t visited Ladakh. “Flights to Leh just touched their lowest honey…8700 a round trip” these words from my husband forever changed my way of looking at things. Most of you wouldn’t understand what I am talking about for precisely two reasons…one you dont keep track of flight tickets to Leh all the year round and secondly you havent gone to a place like Leh. So there it was a morning Go airways flight from 1D terminal and five of us embarked on what would probably be the trip of our lifetimes. “It takes 24 to 48 hours to get acclimatized in Leh” Internet travel forums, friends, friends of friends, family and almost anyone who cared to give us advice told us this. But what with amazing office deadlines and life in general, we had a trip of total three days. Yes you heard that right! Only three days. Now subtract 24 or 48 hours and you are left with something less than 24 hours effectively. But we removed all such notions from our mind and decided to be ground breakers. Rewrite the process of acclimatization for ourselves. “Everything will be done. We will make all your arrangements. Local Leh markets, Khardung La, Nubra and Pangong. Please leave it all on us. And its an off season you would get the best rates ma’am.” With that our bookings for Rainbow guest house was done. “We are in Leh!! We are in Leh! 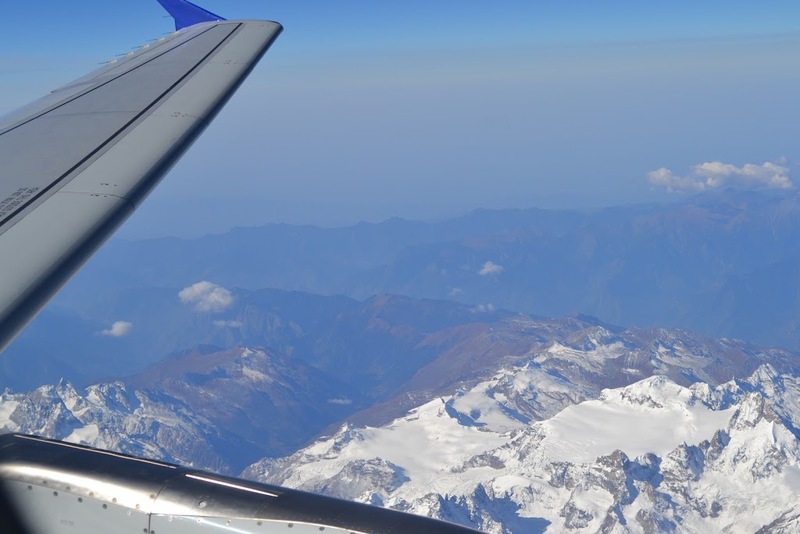 !” a jumping Anvita in the plane’s aisle drew a lot of amused looks from other passengers. But then how can one blame her, we were after all in Leh. After a million BBMs and a hundred calls, our trip had been made and finally executed. A car was waiting for us at the airport and that one ride to the guesthouse began what would finally become our most cherished three days. “Stay indoors for one whole day, rest sleep, you would get acclimatized. Its very cold here.” These were the first words that greeted us at Rainbow. But did that deter us? Not at all. A flat two hours rest and we were out. So after a day’s worth of beauty and amazement, we were finally heading back to the guesthouse for dinner and rest. “You want to have dinner at the guest house! There is this amazing restaurant called Gezmo in Leh, why dont you join me for dinner there” Bharat was a friend of a colleague who was working in Leh. His words kicked in the vacation mood for all of us and we thought heading to guesthouse by 8 in the night wasnt us at all. After an hour of sumptuous dinner and super exciting conversations ranging from Ladakh’s autonomous state to its negative thirty five temperatures in winters, we finally headed back home- in this case Rainbow. Exhausted and extremely sleepy, I slept the moment I struck the bed. I could hear others talking, going out for walks and like. But then my slumber overcame any inclination I entertained in joining them. 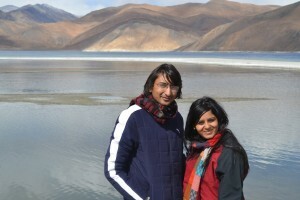 We were supposed to leave at sharp five o clock for Pangong lake next day. The Pangong lake or the “three idiots lake” as its being popularly called off late. I was quite excited about the day two itinerary. “Richa Richa, Anvita is having a very bad stomach. She has vomited at night. We dont think she is fit enough to travel,” Ishleen’s words finally broke our record of altitude sickness free day One. Leh’s low oxygen atmosphere had found the first victim. We changed our plan. 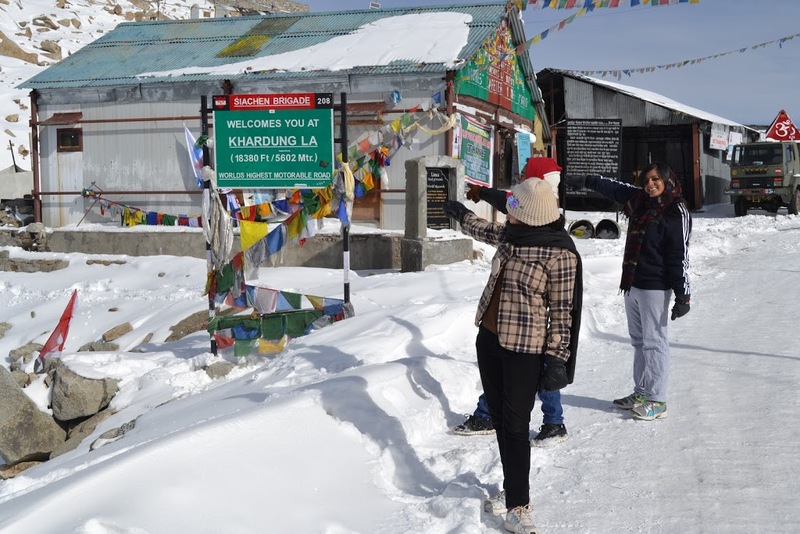 We decided to go to khardung la. If she has to miss a place, it better not be Pangong. Its everything she had come here for. So we a heavy heart due to a lost comrade we began our ride to Khardung La pass. 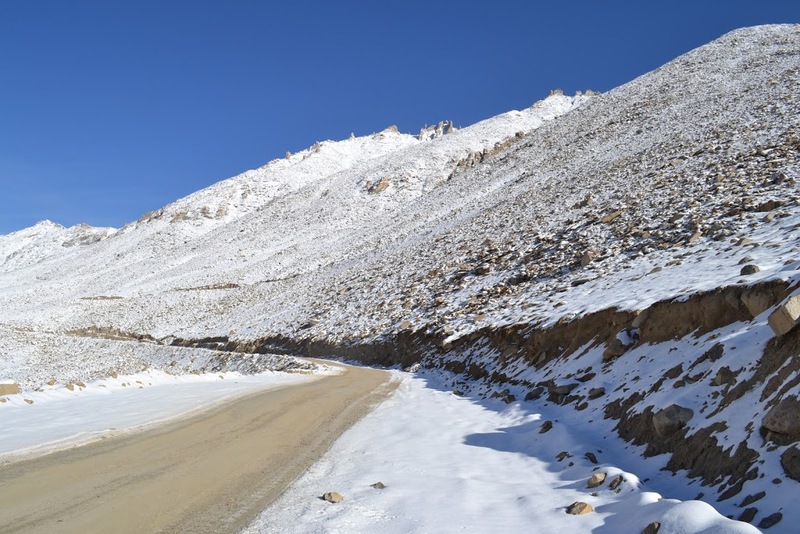 Khardung La “arguably” the highest motorable pass in the world. “Arguably” because if you would check wikipedia it begs to differ. But the Indian government still believes its a world record. The route to khardung la was a dangerous one. This was duly informed by our driver at the onset of the journey. This fact almost nil effect on our spirits. Well moving on. The route to the pass might be dangerous but it was definitely a breathtaking one. So where was I? 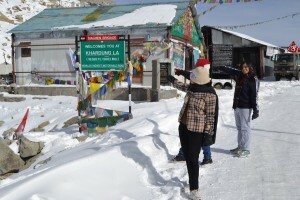 yes only 2Km away from the khardung la pass our car got stuck on ice. Every time driver accelerated or changed gears the car would skid. It had become quite a situation for us. The car was not moving an inch forward. So after about half an hour of pushing and pulling, the car finally gained momentum and moved forward. In one quick swerve we covered two kilometres and reached 17500 feet to a board proudly proclaiming its world record. The journey back took us around two hours more and we reached the guest house by eleven o clock sharp. 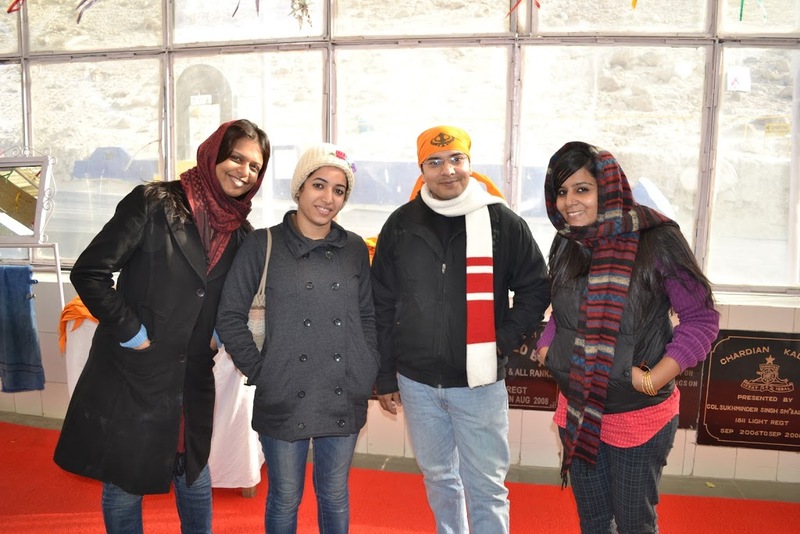 This time round our resilience to Leh’s rarefied atmosphere began to get slightly dampened. We could all feel headaches and nausea and desperately required to pop dispirins. We rested for an hour or so and finally left to see the monasteries. There were two on our list that day- Hemis and thicksey. 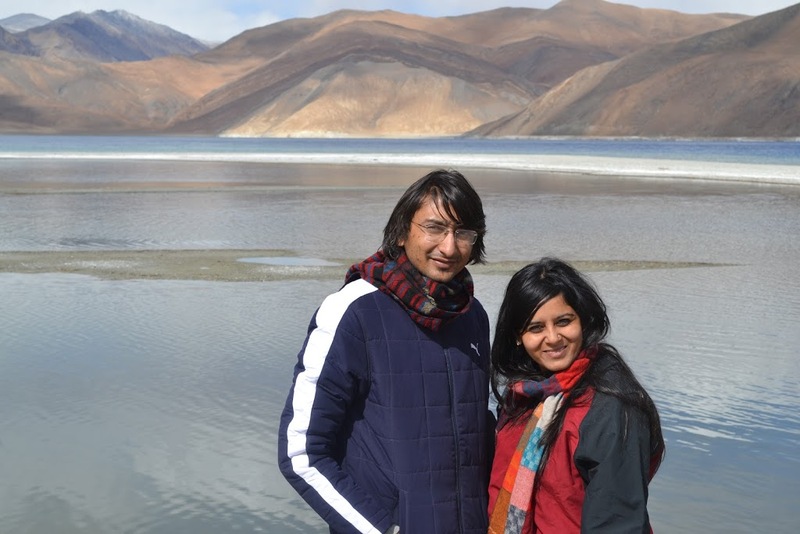 able to go to Pangong the next day. 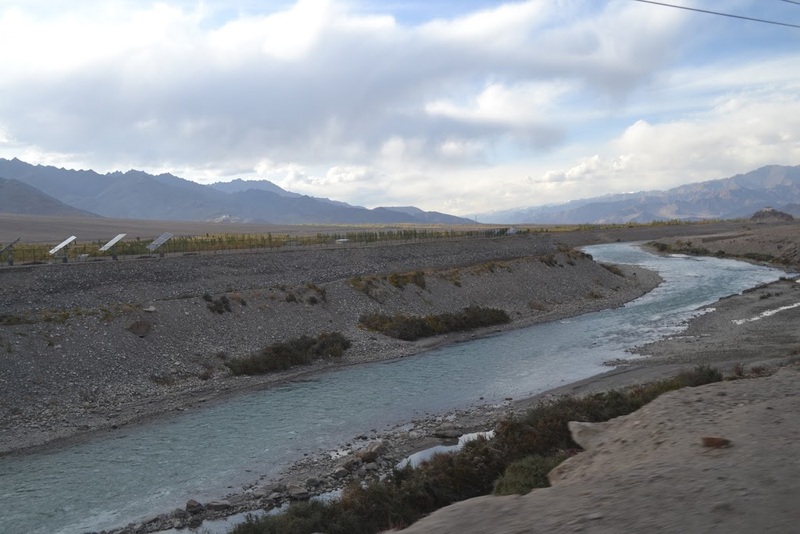 But when one is in Ladakh, its not just about the destinations in fact its much more about the route to these destinations. The road we took to Hemis was one straight out of the paintings. It left us mesmerised. On the way to Thiksey, Anvita booked her tickets back to New Delhi for next day. A day ahead of the planned departure. We obviously didnt say much to her because we knew that more than us she was being affected by the sudden drop in her fitness. We came back to the guest house, went off to sleep a little early deciding that we needed rest for the long trip to Pangong tomorrow. Next day greeted me with amazing news. 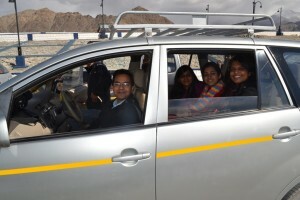 Anvita had got her tickets cancelled and she was finally coming along with us to Pangong. So everything was back to normal. Just one thing had gone wrong now. A night before I had taken a medicine called dimox as a precaution for the long trip to Pangong. The medicine was supposed to help me get acclimatised. It did quite the opposite.It crashed my blood pressure. I couldnt even get up from the bed. But somehow I gathered all my will power and decided to go. breathtaking. It was worth all the efforts and will power from my side. When we went back that day to the guest house we didnt sleep till about 12 in the night. 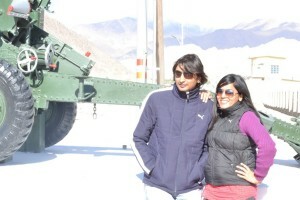 The excitement of having visited Leh and completed the trip that too in October was too much for us. So many people had warned us how terribly cold it might be there this time of the season. 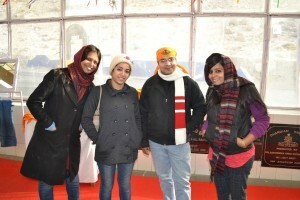 Well I wish I could tell each one of them it was worse but guess what it made our trip to Leh just that more memorable. We took the morning 10.20 flight back to Delhi. The car horns, the traffic the high rise building obstructing the very sky its trying to reach.The pollution in the air replacing oxygen made me miss Leh all the more. I am sure it will take me almost a month to get acclimatised here. Superb Post 😀 loved it refreshed my memories Leh is such a place would love to go again and again. Very well documented. Very immaculate and subtle use of words…this language, English, brings out the best of the emotions…very well framed sentences..the entire description of the trip seems like a well-knit story and like a comic book..very well supported by the snaps…good job! !…Keep blogging!! Wow, what a lovely you had. Been wanting to go to Leh and Ladakh for quite some time. I just loved your post…. every detail… I still ask myself why have I not been there yet? Damn me…. Cheers to you! Ladakh is a lovely place with a unique beauty of its own. One needs a long break to explore it throughly. Very well summarized madam ji. The place is heaven on earth. The adventure n memories it offers is just the bloody best..
superb narration of trip. 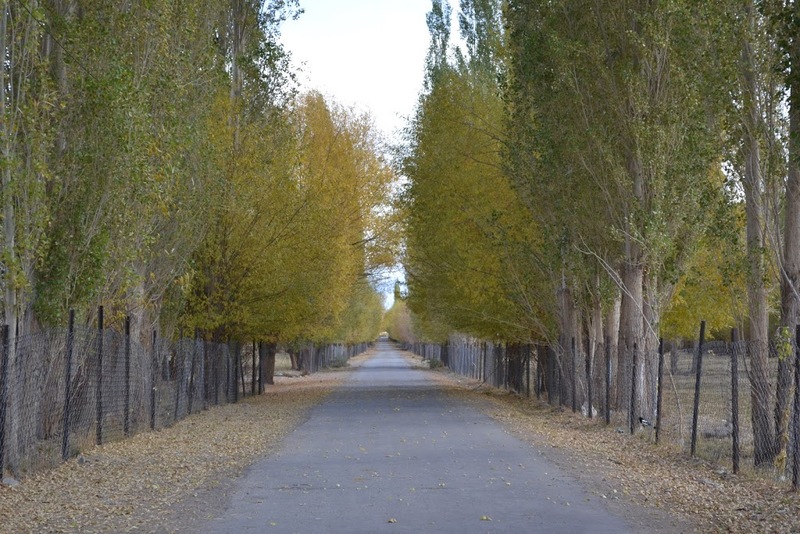 reminding the syle of Chetan bhagat….would like to see blog more descriptive… adding the scenic of vising places in LEH. I think Jay u must go that place on priority it demands that!! Yes Himanshu u have to go to that place and dont curse just go!! Yes sabyaschi just that I had a few days only.. a long trip wud make it more worthwhile!